Lévy Gorvy is pleased to present a solo exhibition of new paintings by renowned Korean artist Chung Sang-Hwa. Featuring seven recent white monochrome paintings by the artist, this represents the first solo exhibition of Chung’s work in London. The gallery previously held the inaugural exhibition of Chung’s paintings in New York in the summer of 2016. 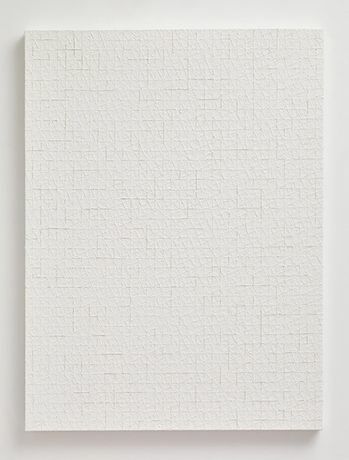 The works included in Seven Paintings demonstrate Chung’s career-long engagement with repetition, ritual, and process, highlighting the infinite complexity and nuance available in the white monochrome format. Eliminating decisions of scale (each canvas is 130 x 97 cm) and coloration, Chung instead foregrounds his meditative painting method. The result is a suite of subtly evocative works with intricate variations in surface and texture. A leading figure of the Korean Tansaekhwa, or ‘monochrome painting’ group, Chung is recognized for the innovative painting method he developed in the early 1970s, which the critic Kwang Suh Oh describes as ‘taking off/removing’ and ‘re-painting.’ In this highly meticulous process, the artist first coats the canvas with a mixture of glue, water, and kaolin clay, and then scores gridlines on its reverse. After the mixture has dried, he ritualistically and intuitively folds the canvas, and then strips the hardened material from the surface in narrow bands. Afterwards, he fills the segments of bare canvas with acrylic paint. 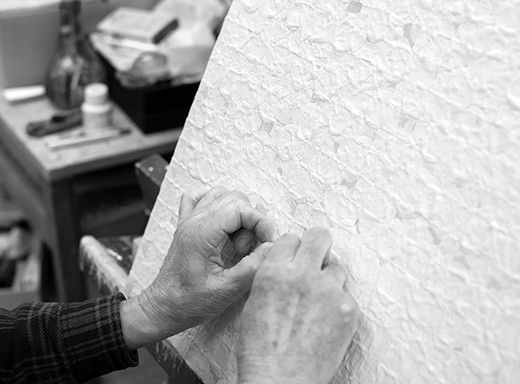 Chung repeats this process in succession to create multilayered, complex surfaces. Chung’s works have grown more intricate over the course of his career, as the artist continues to explore variations of the grid pattern. The paintings featured at Lévy Gorvy embody a temporal stratification, a multiplicity of processes that convey the experience of time through artistic gesture. Art historian Lóránd Hegyi writes that Chung’s work initiates a ‘metaphorical archeology’ within the viewer—an internal excavation of the artist’s process that leads to self-realization. In a manner unparalleled in modern East Asian art, his work calls into question the idea of painting as pure surface and introduces a poetic, phenomenological aspect at the center of the viewing experience. 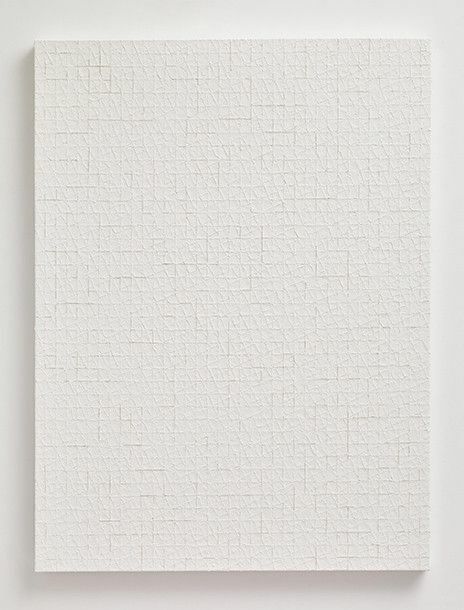 The group of artists Chung is associated with, Tansaekhwa, emerged in Korea in the mid-1960s, and includes Chung, Park Seo-Bo, and Lee Ufan, among others. Dating from Korea’s emergence as an autonomous global and cultural power in the wake of the nation’s emancipation from Japanese rule in 1945 and the devastation of the Korean War from 1950 to 1953, Tansaekhwa is indicative of the new position of historical and international primacy that the country assumed in the postwar years. During this time of independence, Korean artists entered into cultural exchange with various prominent art movements, including Abstract Expressionism in the United States, Art informel in France, and Gutai in Japan. Following an initial period of influence from these movements, characterized by Korean informel, Tansaekhwa developed as a distinctly modern phenomenon, a blending of tradition and innovation exemplary of Korea’s new presence on the world stage. Although it has ties to Minimalism, Tansaekhwa is distinct from the Western tradition of abstraction because of its engagement with such Eastern philosophies as Taoism, Neo-Confucianism, and Buddhism. Tansaekhwa was not a formally organized group, and did not have an artistic manifesto or clearly delineated objectives, instead functioning as a loose association of artists. Chung developed his signature process while living in Kobe, Japan in the early 1970s, and simultaneously pursued a different style of painting, which is closely related to assemblage and features brightly-colored geometric shapes over untouched canvases. The latter evinces his engagement with the Japanese Gutai movement, bolstered by a close friendship with Jirō Yoshihara, the group’s leader. Living in Paris, Kobe, and Seoul for extended periods of time throughout the last three decades of the twentieth century, Chung enacted a genuinely cosmopolitan practice. In conjunction with the 2016 New York exhibition, Lévy Gorvy published a catalogue featuring a newly commissioned essay on Chung’s work by art historian Tim Griffin, an original poem by Yuko Otomo written in response to the temporal encounter with Chung’s painting, and a comprehensive chronology situating Chung’s life and work within the context of postwar art and culture.